Currently viewing the category: "Pittsburgh Pirates"
The answer is simple Pat; the road-Pirates are stuck in a loveless, dystopian future and if they just stopped taking the government issues pills they might be able to escape. Happy Opening Day Win Over the Dodgers Day! 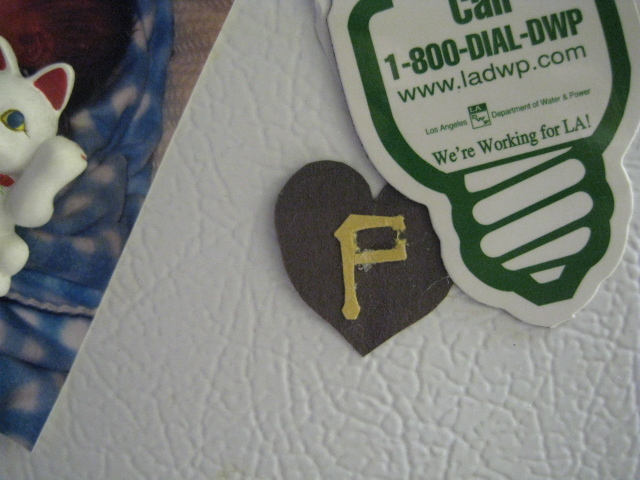 Two years ago I made the smallest Pirates heart I could for a baseball Valentine’s Day/Pitchers and Catchers post on Ladies. Part of the logo is missing, but it’s still on my fridge. Small post I did for Texas Gal out in Center Field, as she helps Red Sox Nation get into a Pirate state of mind to welcome their new fielder, Jason Bay. Let’s hope they are kind to him. Maybe the old guys can play instead. The Post-Gazette certainly knows how to play to the hometown fans, and I’m not talking about moneybags Matt Morris.